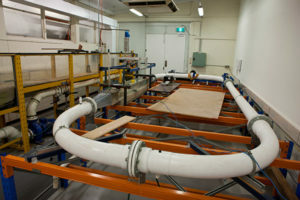 The Offshore Fluid Mechanics team at UWA have developed a range of experimental facilities in order to further their research and support industry needs. General information about the key experimental facilities used by the Offshore Fluid Mechanics team at UWA is located here. The large and a mini O-tubes are unique to UWA. They operate by rapidly circulating water to simulate realistic near-seabed wave and current conditions, including extreme events. These facilities can be used to create cyclonic conditions in a controlled experimental environment in order to assess how seabed sediment, pipelines, other infrastructure and flora interact in the marine environment. Further information is available here. The RiverLab is a unique initiative aimed at developing innovations in offshore engineering via research, education and outreach. To achieve this aim it is bringing together a community of researchers and a collection of equipment to enable unique field measurements and experiments in the Swan River. Further information is available here.